The catchy title for Tasmania’s inaugural Hobiennale festival references the recurring exhibitions that have become ubiquitous around the world as a form of cultural capital. But this is not the Hobart Biennale — it’s not a big budget, state-run event, but a festival that celebrates the humble ARI, the Artist Run Initiative. The festival’s name is a composite that in some respects parodies the scale and seriousness of the biennale as institution, replacing the national pavilions of the Venice Biennale with local ARIs that are more likely to collaborate than compete. Each ARI represents a community, a model of working and a significant contribution to the art scene. Staged just as this year’s trio of internationally dominant art festivals — the Venice Biennale, Documenta, the Munster Sculpture Triennial — draw to a close, the Hobiennale is a reminder of the importance of supporting local, experimental events at the bottom of the world. With 18 participating ARIs from Australia and New Zealand, over 100 artists, dozens of exhibitions, performances, critical discussions and participatory events, Hobiennale was always going to be a busy and ambitious event. It also turned out to be one of the most exciting I’ve ever attended, with unscheduled performances, an interested and engaged audience and an evolving and nimble program that reflected the energy and excitement of the artist organisations involved. The inaugural event was curated by Liam James and Grace Herbert and facilitated by Hobart’s Constance ARI, an organisation that (like many ARIs of late) has shifted from being a physical space with a regular gallery program to a project-based model. Hobiennale inhabited everything from existing art galleries to underground heritage sites and public spaces, many of them usually under-utilised. The 19th century neo-Gothic Domain House held exhibitions curated by FELTspace, Moana, Success and The Curated Shelf + Radio 33. The house is still undergoing vital repairs, but compared to the last time it was open for a one-off exhibition, there was significantly less rot. 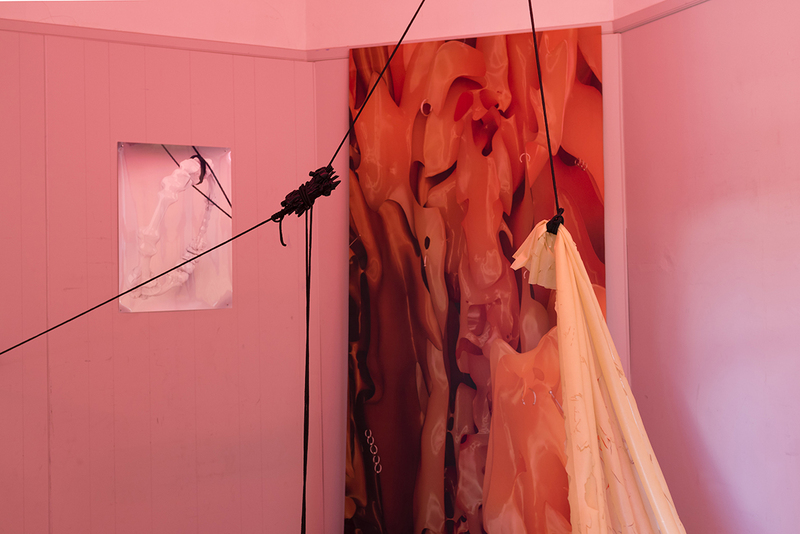 Eloise Kirk’s installation of paintings picked up on the colour scheme of one of the upstairs annex rooms: the flaking spearmint upper coat and the pink layer underneath. Her paintings were installed upright, the front surface deliciously shiny, the back uncoated wood, picking up on the patchwork of raw timber covering holes in the dilapidated walls. Adelaide artist Monte Masi’s recitation of the text-based work, IN-SPI-RAY SHUN-SHUN APP-LI-KAY SHUN-SHUN (2017) at Domain House was not listed on the official program, yet it was one of the best performances of the festival. The artist’s words were rhythmic, relentless, interweaving the administrative language of applications with absurd statements laced with a mixture of artspeak and lyrics: “describe how you envision the work will be installed in the space / for example / zero visibility / large scale paintings occupying the / south wall / everywhere is hot.” Drawing frequent laughs, he spoke to a specific and very sympathetic audience for whom the language is very familiar. The work was shown as part of the FELTcult exhibition at Domain House presented by Adelaide ARI FELTspace, which explored the notion of ARI culture as “cult,” and given the knowing glances passing between audience members during Masi’s performance, the point was well made. Also drawing on ARI administration was Jenna Pippett’s Doing Stuff with Anne.J: Episode 6 — How to Volunteer at FELTspace (2017), which used the language of 1980s instructional videos to draw attention to the unpaid labour upon which ARIs (and the arts sector more broadly) rely. While the FELTspace exhibition was conceptually tight, the install was disappointing and the works seemed to float in the centre of the room, detached from the aesthetically noisy surroundings. By comparison, Perth-based ARI Success, inhabited the basement level with a layout that emulated an archaeological museum – an apt layout for an exhibition interrogating cultural assets and the production of history. Light as a Feather… by another Perth ARI, Moana Project Space, also seemed appropriate for the dilapidated neo-Gothic house. The exhibition celebrated the enduring influence of the “teen witch” as a feminist symbol of strength. At its centre was a rather crude wunderkammer that unfortunately received fewer donations of curious objects than it deserved. The shrine by Grace Connors combined 21st century technology with references to the cult 90s movie, The Craft (1996) — a movie that had (from personal experience) many teenagers of the time in search of magical distraction, chanting, “Hail to the Guardians of the Watchtowers of the East…” Between the installation of mood rings and chewing gum by Oliver Hull and Celeste Njoo, the knitted jumper dress “witch kit” by Emma Busswell and Lyndon Blue’s naïve painting of a Fiat perched atop an open fireplace, the Moana exhibition was a little haphazard. Indulgently nostalgic, it nonetheless succeeded with its strong sense of play. An element of play could be seen again in the work by Theia Connell, performed by Greta Wyatt and Grace Marlow as part of the Greater Union exhibition curated by Sister (a relatively new Adelaide ARI). In the basement of an abandoned cinema, the duo caressed a ribbon of electronic text in a careful dance of negotiation. The bottom half of the ribbon was dead, although the text would occasionally flow through as the kinks in the wiring were manipulated. While unintended, the anxious energy of the performers trying to coax the text past the faulty connection made for fascinating viewing. 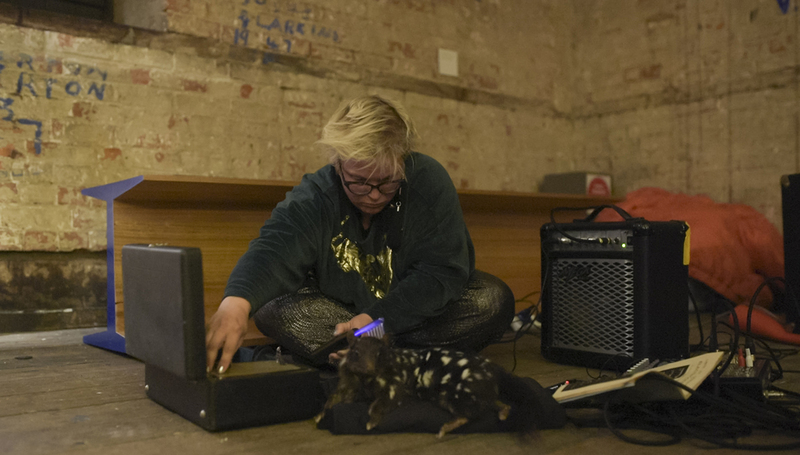 Another favourite performance was Julia Drouhin’s interaction with a taxidermied quoll as part of Sonic Systematics, curated by Pip Stafford. Sitting cross-legged in the corner of the convict-era Bond Store and surrounded by vitrines of specimens, Drouhin treated the animal with an antique Provita Generator or violet ray — an early 20th century device used to address everything from spinal conditions to dental abscesses. Borrowed from the Tasmanian Museum and Art Gallery’s (TMAG) education department, the quoll was taxidermied in a way that rendered the Tasmanian carnivore cute, domestic and even a little bit cool, making Drouhin’s pseudo-ritual all the more curious and absurd. TMAG also played host to Makiko Yamamoto’s outstanding Utterly Silent, Utter Silence, Utterly Something, Thinking Thinking, Utterly Listening, Utterly Umm… (s 2 ep.1), which used the spoken word as its medium. Presented by Bus Projects (Melbourne), the installation of sound-based works has changed my attitude towards headphones in galleries forever. The artist arranged and lit the headphones in a way that the figures listening with them became a key aesthetic element, and in many respects, the presence of the visitors was as important to the overall experience as the primary soundtracks — something I only truly recognised when I returned to the space after the opening and found myself alone. Hobiennale was as much about celebrating ARIs as it was exhibiting the work curated by them. Although the forums addressed problematic issues, the exhibitions and openings, parties and performances were largely celebratory events. The NAVA forum, I Don’t Work for Free: Tensions in Artist Run Initiatives could have gone for days, the one hour time-slot barely scratching the surface of this broad yet important topic. However, the issue was continually (and probably better) discussed during the informal conversations that took place throughout the festival. These incidental discussions were particularly evident at events like Frontyard’s (self-described as a “Not-Only-Artist Run Initiative”) potluck dinner and book launch, the culmination of a series of open conversation sessions at a local community arts centre. FELTspace might have put forth the notion of the ARI as cult, but Hobiennale demonstrated that the ARI is very much a social system, and one that is central to the contemporary art scene. At every event, artists were exchanging ideas, planning new projects and comparing and debating models of funding and programming. Artists might have bemoaned the lack of funding, obstructionist authorities, as well as the difficulties of finding free or low-rent spaces, but the mood among participants seemed largely enthusiastic and positive. As noted earlier, few of the spaces Hobiennale inhabited were white-walled galleries. 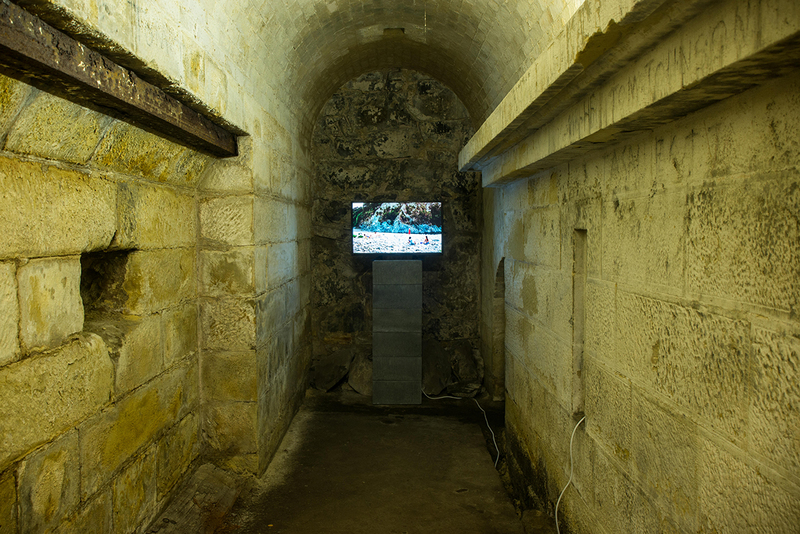 It gave visitors to Hobart and locals alike an opportunity to experience places usually closed to the public, such as Domain House and the underground magazine rooms of the early 19th century Princess Park Battery. It reflects the current popularity of unusual and meaningful sites as exhibition spaces, as well as the make-do attitude of many artists, who can and will do incredible things with just about any space if only they are made available. The Hobart ARI, Visual Bulk, for instance, exists within a tiny city garage/basement, hosting a fast-paced exhibition program that consistently shows some of the best experimental art in Hobart. Another participating ARI, Alaska, operates out of a carpark in Sydney’s Kings Cross, and the before-mentioned Success ran a program underneath a former department store in Fremantle before recently switching to an off-site model. Of course, when exhibiting stand-alone work (as opposed to work made specifically for a site), there’s a significant difference between a garage and underground fortifications. Yet, when sites are used strategically — as in the case of Christopher Ulutupu’s The Romantic Picturesque (presented by New Zealand ARI, Playstation) — they can enhance certain aspects of place and alter our reading of pre-existing works. On entering the dank underground battery space, visitors could hear the soundtrack of Ulutupu’s central karaoke video work, including the upbeat pop song “Brown Girl in the Ring,” which contrasted with the shadowy environment. 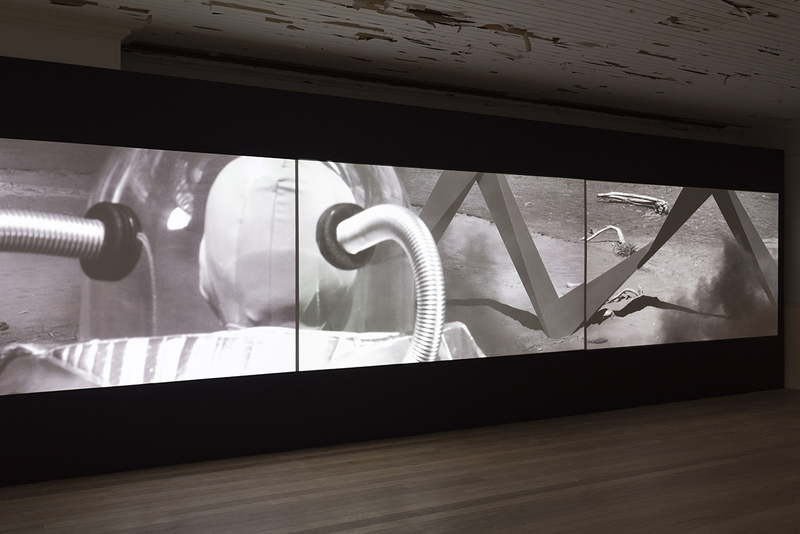 The act of entering such a space prepared the viewer for the darker side of Ulutupu’s videos, which evoke romantic ideals of landscape, family and place with an uneasy twist. On first glance the video painted a rosy picture of two women singing karaoke in a forest. However, there’s an unmistakable tension created between the women and the white man being groomed off to the side, his eyes on the women, his gaze unreciprocated. 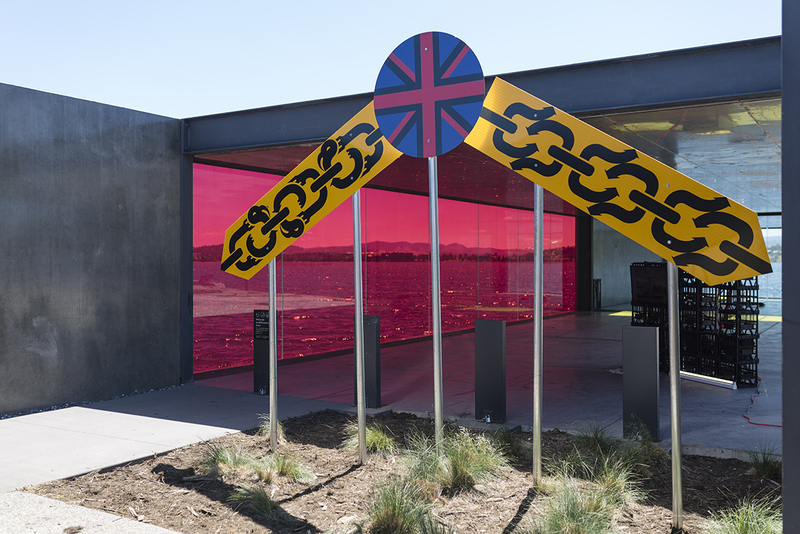 Representing Meanwhile (the other New Zealand ARI), Kauri Hawkins’ public artwork combined the familiar language of street signage with contemporary kowhaiwhai (Māori painting). Hawkins described a kind of new colonisation in which Māori are moving to Australia from New Zealand seeking wealth. The sculpture was naturally flashy, made from highly reflective signage material and shaped like wings. The initial location was a little odd, awkwardly tucked in among the Glenorchy Art and Sculpture Park pavilion. It was later moved to the colonial era Rosny Schoolhouse complex, which gave it a little more space, although I felt it demanded still more. Surface World, the excellent exhibition by the Australian National Capital Artists (Canberra), took advantage of a half-renovated building, The Commons, to produce installations that worked with the crumbling walls and mis-match of doors. Patrick Larmour’s intricate paintings were hung on bubble-wrap coated walls — a textural lead-up to Grace Blake’s gloriously silky and suggestive web of latex. 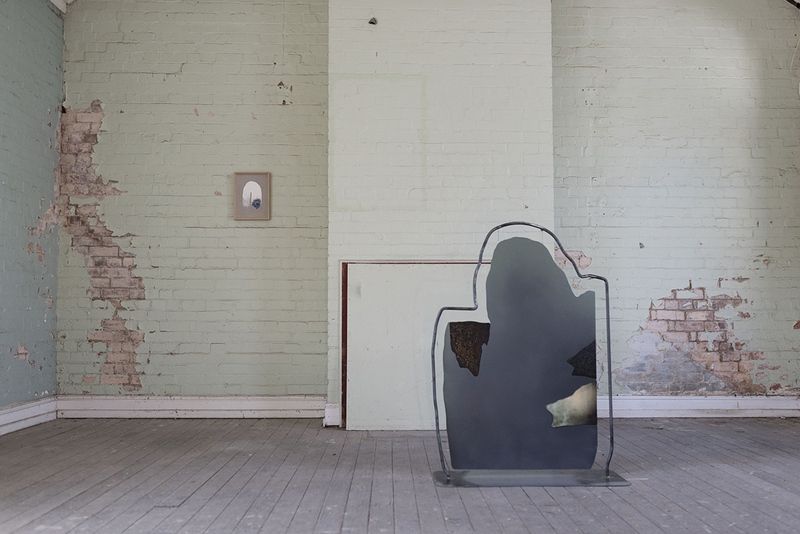 Cat Mueller’s geometric paintings drew attention to the patterning of the partly exposed lath walls, and Tom Buckland’s tiny peephole dioramas gave us a glimpse into intriguing and sometimes disastrous technological scenarios. There were far too many excellent events in Hobiennale’s demanding program to cover in a single review. The festival was rightly supported by a range of funding bodies, including the Australia Council for the Arts, yet existed on a relative shoestring, relying (as most ARIs do) on volunteer labour and the goodwill of artists and curators. Despite these challenges, it was a festival with a distinct personality, and one that larger biennales could learn from for its experimentation and nimble programming. Watch a visual overview of the Hobiennale, featuring interviews with festival directors Grace Herbert and Liam James, and participants from Brisbane, Sydney and Alice Springs, below.